If you’re not adding vegetables to your smoothies, you’re missing out! We’re talking ingredients beyond spinach and kale, too. Think zucchini, sweet potato, cauliflower and beets. Adding vegetables to smoothies is a great way to sneak more veggies into your diet and take full advantage of the wide range of health benefits they offer. 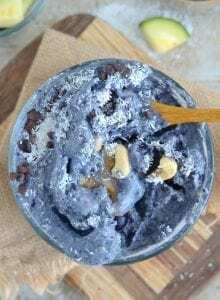 This healthy, low-sugar blueberry coconut smoothie bowl tastes like blueberry ice cream but won’t spike your blood sugar and will help keep you full and energize you for hours. You could make this smoothie with fresh coconut meat but not everyone may be able to find that in their area so today we’re going to use unsweetened shredded coconut. If you can get your hands on fresh coconut, definitely go for it. I can usually find fresh coconut meat at my local Whole Foods Market and I’ll often pick up a package and freeze it for use in smoothies. Fresh coconut in this smoothie is unreal but for today, we’ll keep it accessible with unsweetened shredded coconut. Unsweetened shredded coconut still offers plenty of health benefits so don’t feel like you’re missing out completely if you can’t find fresh coconut. While shredded coconut is composed almost entirely of fat, almost all of which is saturated fat in the form of MCT’s or medium-chain triglycerides, shredded coconut is still associated with many health benefits. MCT’s have been shown to increase HDL cholesterol, provide an immediate source of energy, increase satiety, and boost metabolism. In addition, the MCT’s found in coconut, name lauric, caprylic and capric acid all have an antimicrobial, antiviral and anti-fungal properties, which is why coconut oil is so versatile, in and out of the kitchen. Coconut is also a delicious and nutritious source of fiber, vitamins, minerals, and amino acids and even contains calcium, potassium, and magnesium. Coconut also contains a ton of electrolytes, which is why coconut water is such a great workout drink. For my own health and wellbeing, I’m becoming to understand that stable blood sugar is everything. I talked a lot about this in my post on managing hunger. So, how to keep blood sugar levels stable? Well, the basics of keeping blood sugar levels stable are about the same as the basics of healthy eating. Let’s take a look. Those are the basics but where does fat come in? How Does Fat Help Blood Sugar Levels? In brief, healthy fats from foods like nuts, seeds, avocado and coconut take longer to digest which helps our body slow the absorption of the sugars found in carbohydrates. Fats also don’t cause spike insulin which helps maintain steady insulin levels ie. stable blood sugar levels. 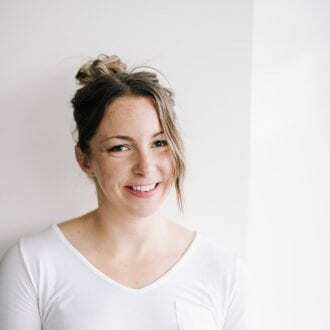 Moderating carbohydrates and including healthy fats in diet can help with sugar cravings, digestive issues and managing blood sugar as well as improve energy, sleep quality and assist with weight loss. Fat is particularly useful when paired with carbohydrates to help slow their digestion. Fats help us stay fuller longer, prevent sugar crashes and healthy, plant-based fats contain a range of powerful antioxidants, vitamins and minerals that are all key to optimum health. Basically, if you want to maintain healthy blood sugar levels, don’t be afraid of fat! We talked about the best superfoods to add to smoothies and while blueberries weren’t on that list, they’re an everyday super-powered superfood you should definitely include in your diet. Blueberries are one of the most antioxidant-rich foods there are. Packed with flavonoids, vitamins and minerals and low in sugar, they’re a must-have in a healthy, well-rounded diet. Blueberries contain anthocyanins, iron, phospfibers, fibre, calcium, magnesium, manganese, zinc and vitamin K, all of which contribute to blueberries cancer-fighting, bone-building, heart-protecting, digestive-supporting and anti-aging benefits. 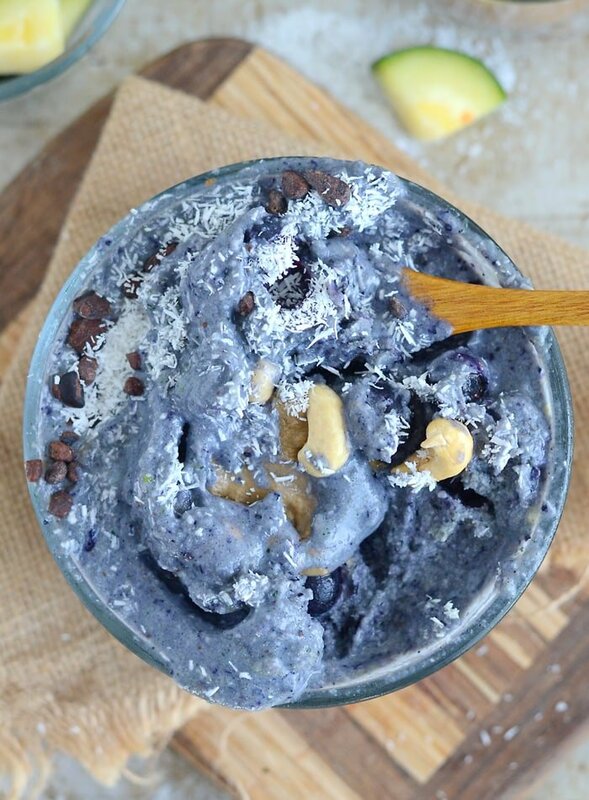 This blueberry coconut smoothie bowl is a top contender for my favourite smoothie bowl ever. 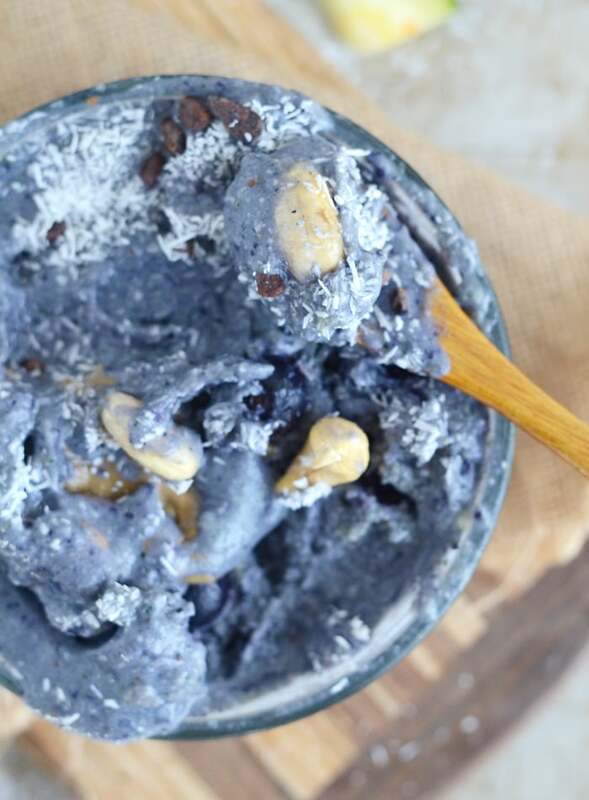 It tastes like blueberry ice cream and the texture is perfect. 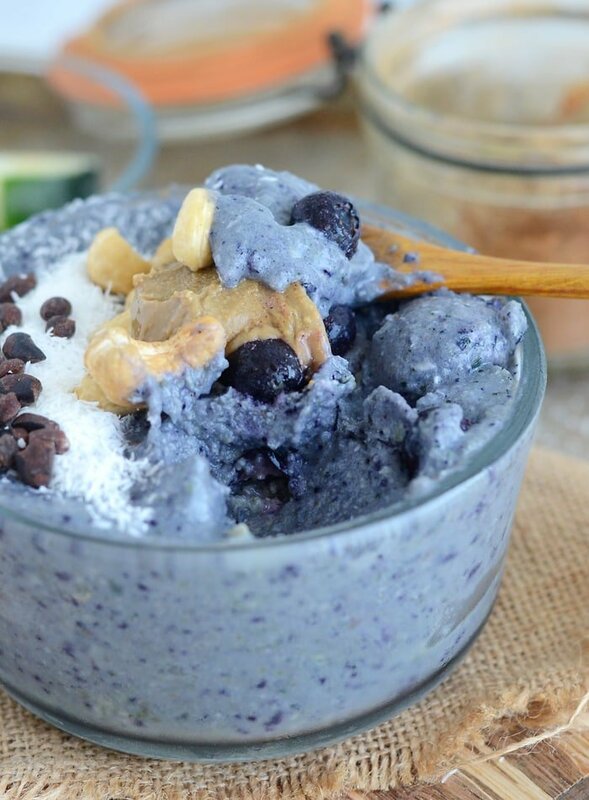 Made with frozen cauliflower, zucchini and blueberries, it’s very low in sugar and packed with nutrition and fibre. If you love smoothie bowls, I’d recommend adding chopping and freezing zucchini and cauliflower to your weekly food prep. They’re the ultimate vegetables to add to smoothies because they add tons of volume and nutrition without changing the flavour. They also both blend beautifully when frozen to create the perfect smoothie bowl consistency. I topped my smoothie bowl with coconut, cashews, cacao nibs, blueberries and sunflower seed butter but any smoothie bowl toppings work! 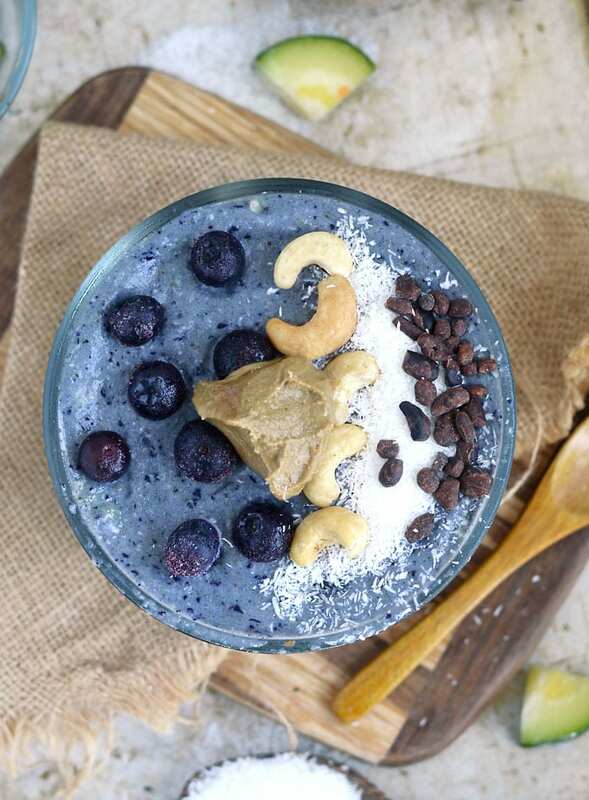 Try your favourite chopped nuts, dried fruit, sliced banana or berries, peanut butter, tahini, hemp seeds, chia seeds or chia seed jam and of course, the ultimate smoothie bowl topping…granola! Did you know I have a vegan smoothies e-book featuring 66 delicious protein-rich recipes and everything you need to start creating your own epic smoothies? Check it out here! My mom is always looking for lo sugar recipes. I am going to share your link with her! OOOH! This recipe looks fantastic! I love smoothie bowls! And blueberries, and coconut! So, I guess this recipe is just pefect for me!!!! 🙂 Thank for you sharing it! I also love the fact that is low-sugar! Yay! Can you believe I still haven’t tried a smoothie bowl yet? This one looks super yummy. This looks delicious! Silly question, do you cook the cauliflower + zucchini before freezing it? I steam the cauliflower before freezing but leave zucchini raw. You could use raw cauliflower but it can be a bit tough on digestion so it depends how your body handles it. I’m fine with raw zucchini, but it can also be steamed first if you prefer. 🙂 hope that helps. Oh! I love it! 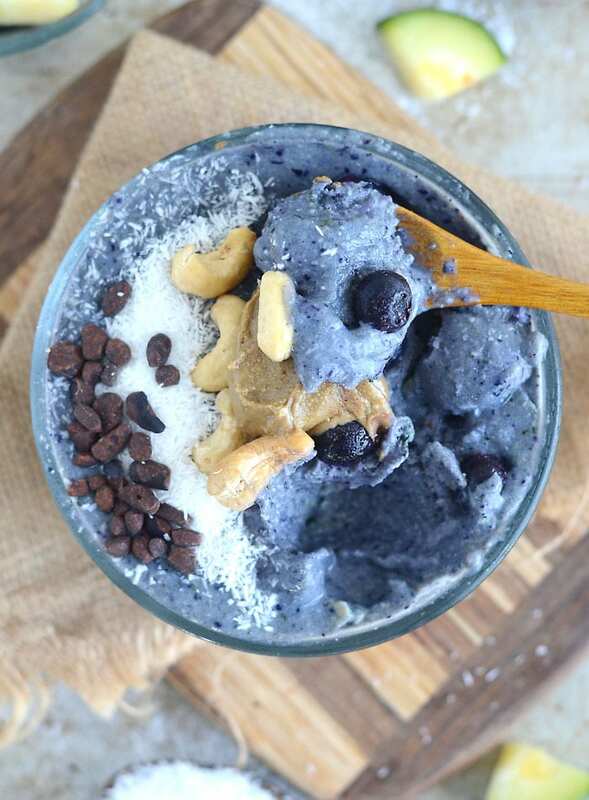 The prefect combination of blueberry and coconut with its super healthy. The best snack/ dessert for me at all times. Have you ever tried this warm? I’m on a Candida diet and can’t have cold things .. thanks! … also you may want to check the ceylon cinnamon link because I think it leads to something else!